Compiled from contemporary accounts by Melvyn Harrison, Chairman, Crystal Palace Foundation with a foreword by Kevin Lynn, Chief Inspector of Construction at the Health and Safety Executive. The HSE are presently running a campaign about accidents at work. For further information see their website at www.hse.gov.uk and click on the shatteredlives link. The history of the Crystal Palace is usually one of fun, excitement and wonder but sadly there is a blacker side. At 2pm on Monday 15th August 1853 a section of scaffolding on the centre transept collapsed killing twelve construction workers. The story of this tragic accident has never been fully told before. All the articles from The Times newspaper (including the Coroners' reports) from 16th - 25th August have been meticulously transcribed together with articles from The Kentish Mercury & Home Counties Advertiser, St Bartholomew's Church Burial Register and a recently discovered fund raising poem. 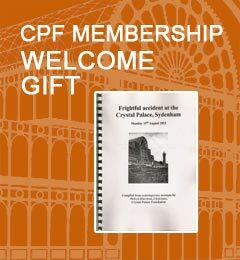 For lovers of the history of the Crystal Palace this book gives a detailed insight into some of the construction methods used on the Crystal Palace and reveals much detail about the nineteenth century coroners system. Names of many construction workers are given together with names of dozens of contributors to the fund set up for the families of the deceased workers.